These guidelines are for relatives, friends, and colleagues of a person with diabetes, who may have to recognise and treat severe hypoglycaemia (also called a hypo, or low blood sugar). The person with diabetes gets glucagon through a doctor's prescription. They should check the expiry date every month, and replace it if it has expired. It is usually stored in the fridge, so everyone knows where it is. Glucagon is a hormone that raises blood sugar (glucose) levels by making the liver release its store of glucose. It is not glucose. You give it by injection to help a person recover from very low blood sugar. In New Zealand it is available as GlucaGen HypoKit. Glucagon should be injected when someone has very low blood sugar (severe hypoglycaemia), or when they cannot swallow, respond when you speak to them, or squeeze your hand when asked. Roll the person onto their side. Make sure they are breathing easily. Call for an ambulance (phone 111 in New Zealand). Do not try to feed the person anything through their mouth if they are unconscious or having seizures. Inject the glucagon into the muscle in their outer thigh. It takes around 10 to 15 minutes for the glucagon to work. If the person is still not responding, give them another injection. Follow the instructions inside the lid. Even if glucagon has expired, you can still inject it and it will probably work. Take the orange cap off the vial. Take the grey needle cover off. Insert the needle through the rubber stopper of the vial. Inject all the liquid from the syringe into the vial. Without removing the needle, gently shake the vial until the powder has dissolved and the solution is clear. Turn the vial upside down and pull back the plunger until all of the solution is in the syringe. Be careful not to pull the plunger out of the syringe. 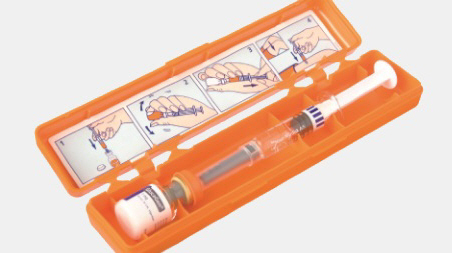 Inject the glucagon into the person's outer thigh. Put the syringe back into its box to be thrown away – don't put the needle cap back on. If you know how to, test the person's blood glucose level. The person should wake up in around 10 to 15 minutes. If they are still not responding, give them another injection. When they are awake, give them sips of ordinary (non-diet) soft drink or another sweet drink. About 60 to 90 minutes later, they may feel sick and even throw up. They may also have a headache. Check their blood sugar (glucose) level, or get them to check, every 15 to 30 minutes. After they begin to feel better they should eat a snack that includes protein and carbohydrate (for example, a sandwich, or crackers and cheese). The person should have their usual insulin injection after a severe hypo, but they should contact a doctor for medical advice on how much insulin to give. After a severe hypo, a person's blood sugar level is often higher than normal. Don't treat this with extra insulin. For two to three days after a severe hypo the person might find it difficult to recognise symptoms of low blood glucose, and their body might be less able than usual to cope with low blood sugar. Written by Christchurch Diabetes Centre. Adapted by HealthInfo clinical advisers. Endorsed by clinical director, Diabetes Services, Canterbury DHB. Last reviewed December 2017. Ambler, G., Cameron, F. (Eds). (2010). Caring for Diabetes in Children and Adolescents (3rd ed.) (pp.80-82). Cryer, P. E. (Author), Hirsch, I. B. (Deputy Editor). (May 15 2014). Management of hypoglycemia during treatment of diabetes mellitus.